Dimitrijevic N. Transitional Justice in Serbia. In: Beširević V, editor. Public Law in Serbia: Twenty Years After. London: Esperia Publications; 2012. p. 57-77. (European Public Law Series). Dimitrijevic N. Duty To Respond: Mass Crime, Denial, and Collective Responsibility. Budapest - New York: CEU Press; 2011. Dimitrijevic N. Moral Knowledge and Mass Crime: A Critical Reading of Moral Relativism. Philosophy and Social Criticism. 2010;36(2):131-56. In this article I ask how moral relativism applies to the analysis of responsibility for mass crime. The focus is on the critical reading of two influential relativist attempts to offer a theoretically consistent response to the challenges imposed by extreme criminal practices. First, I explore Gilbert Harman’s analytical effort to conceptualize the reach of moral discourse. According to Harman, mass crime creates a contextually specific relationship to which moral judgments do not apply any more. Second, I analyze the inability thesis, which claims that the agents of mass crime are not able to distinguish between right and wrong. Richard Arneson, Michael Zimmerman and Geoffrey Scarre do not deny the moral wrongness of crime. However, having introduced the claim of authenticity as a specific feature of the inability thesis, they maintain that killers are not responsible. I argue that these positions do not hold. The relativist failure to properly conceptualize responsibility for mass crime follows from the mistaken view of moral autonomy, which then leads to the erroneous explanation of the establishment, authority and justification of moral judgments. Dimitrijevic N. A continuity of silence in Serbia : from the irrelevance of human rights to collective crime, and beyond. In: Bhambra GK, Shilliam R, editors. Silencing human rights : critical engagements with a contested project. New York: Palgrave Macmillan; 2009. p. 124-44. Dimitrijevic N. Tibor Várady in Yugoslavia and Serbia. In: Resolving international conflicts : liber amicorum Tibor Várady. Budapest: CEU Press; 2009. x-xii. Dimitrijevic N. Patriotska knjiga coveka bez domovine : Viktor Ivančić, "Animal Croatica". Rec. 2009;24:35-45. Dimitrijevic N. Zlocinacki rezim, njegovi podanici i masovni zlocin. Vol 25.; 2009. Dimitrijevic N. Moral, kultura i zlocin: Prilog kritickoj analizi relativizma. Rec. 2008;23:27-69. Dimitrijevic N. Serbia After the Criminal Past: What Went Wrong and What Should be Done. International Journal Of Transitional Justice. 2008;2(1):5-22. Dimitrijevic N. Vrednosti za obezvređeno drustvo: ustavna moralnost posle kolektivnog zlocina. Zenicke sveske. 2008;8:237-60. Dimitrijevic N. Ustavna demokratija shvacena kontekstualno. Beograd: Fabrika Knjiga; 2007. Dimitrijevic N. Justice beyond Blame: Moral Justification of (the Idea of) a Truth Commission. Journal of conflict resolution. 2006;50(3):368-82. Dimitrijevic N. Rodoljupci pisu ustav. Rec. 2006;20:21-7. Dimitrijevic N. Moral responsibility for collective crime: Transitional justice in the former Yugoslavia. Eurozine. 2006. Dimitrijevic N. Coming to Terms With the Evil Past: Does Serbia and Montenegro Need a Truth Commission?. In: Between Authoritarianism and Democracy: Serbia, Montenegro, Croatia. Volume II: Civil Society and Political Culture. Belgrade: Cedet; 2005. Dimitrijevic N. Kad padne rezim: zasto je proslost vazna. Rec. 2005;19:11-53. Managing Hatred and Distrust : The prognosis for post-conflict settlement in multiethnic communities in the former Yugoslavia. Dimitrijevic N, Kovács P, editors. Budapest: LGI; 2004. Dimitrijevic N. Introduction : Managing hatred and distrust : changes from the bottom and the top. 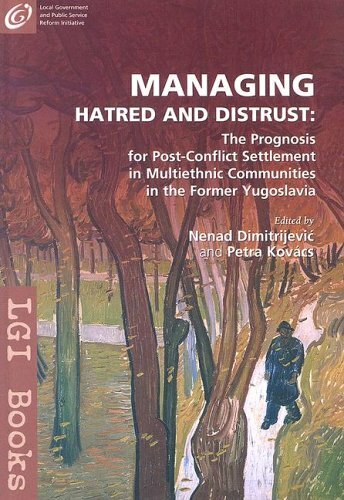 In: Managing hatred and distrust : the prognosis for post-conflict settlement in multiethnic communities in the former Yugoslavia. Budapest: LGI; 2004. xix-xxvi. Dimitrijevic N. Constitutionalism and the privatized states. In: Serban M, editor. Constitutionalism in transition : Africa and Eastern Europe. Warsaw: Helsinki Foundation for Human Rights; 2003. p. 237-60. Dimitrijevic N. Srbija kao nedovrsena drzava. Rec. 2003;15:5-21. Dimitrijevic N. Suocavanje s losom prosloscu: treba li Srbiji i Crnoj Gori komisija za istinu? Rec. 2003;17:65-85. Dimitrijevic N. Szabad a gyűlölet: a jugoszláv szocializmustól a szerb nacionalizmusig. In: Csepeli G, Örkény A, editors. Gyűlölet és politika. Budapest: Minoritás Alapítvány; 2002. p. 138-155. Dimitrijevic N. Ethno-Nationalized States of Eastern Europe: Is There a Constitutional Alternative? Studies in East European thought. 2002;54(4):245-69. Dimitrijevic N. Slucaj Jugoslavija : socijalizam, nacionalizam, posledice. Beograd: B92; 2001. Dimitrijevic N. Paradoxes of Constitutional Continuity in the Context of Disputed Statehood. In: Spasic I, editor. Revolution and Order. Belgrade: Institute for Philosophy and Social Theory; 2001. p. 275-82. 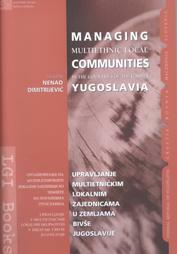 Managing multiethnic local communities in the countries of the former Yugoslavia. Dimitrijevic N, editor. Budapest: LGI; 2000. Dimitrijevic N. Ustavna demokratija, ili kako spreciti vladavinu naroda. Habitus. 2000:35-56. Dimitrijevic N. Introduction : Managing distrust and hatred ::multiethnic local communitries in the countries of the former Yugoslavia. Budapest: LGI; 2000. Dimitrijevic N. Words and death : Serbian nationalist intellectuals. In: Bozóki A, editor. Intellectuals and politics in Central Europe. Budapest: CEU Press; 1999. p. 119-48. Dimitrijevic N. Kad Bombe Prestanu Da Padaju Kojim Cemo Jezikom Govoriti. Rec. 1999;1:16-24. Dimitrijevic N. O Kosovu i srpskoj "krivici". Rec. 1999;1:90-100. Dimitrijevic N. Ustav kao akt pozitiviranja društvenog ugovora. Habitus. 1999:117-38. Dimitrijevic N. Region u postsocijalizmu : o cemu mislimo kad govorimo o demokratiji. In: Regionalizam kao put ka otvorenom drustvu. Beograd: Visio Mundi; 1994. p. 65-105. Várady T, Dimitrijevic N. Survey on presidential powers in Eastern Europe : ex-Yugoslavia. East European Constitutional Review. 1994;3(1):75-81. Dimitrijevic N. Nemacki parlamentarizam. Arhiv za pravne i drusttvene nauke. 1992;78(1):111-30. Dimitrijevic N, Turi G. Az eszményektöl nyert legitimitás. Létünk. 1989;19(3-4):539-56. Dimitrijevic N. Teritorijalna autonomija i ustavnost. Savremennost. 1988;18(10-11):32-9.